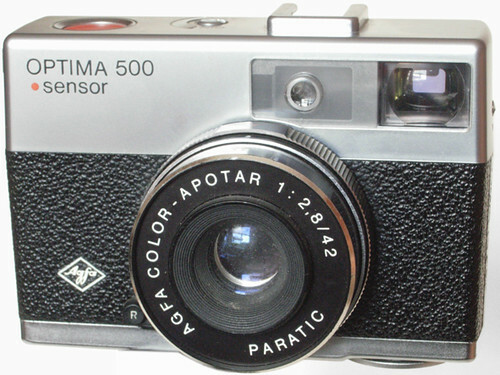 The Optima Sensor 500, made by Agfa in Germany - c.1972/3 - is a fairly eccentric 35mm viewfinder camera with automatic exposure. 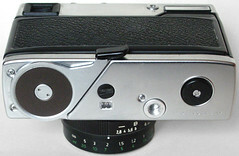 Like all Agfa "Sensor "cameras, it has the large round orange shutter release in the top plate. There is also a cable release socket on the back. The advance lever is on the bottom plate, to the users left. This doubles as the rewind lever. To rewind, the rewind release, mounted beside the lens, is moved in towards the lens and upward - where it latches. The advance lever is now reverse-geared to be a rewinder. Opening the back, using the catch on the right-hand end, releases the film-spool drive spindle- which springs out of the bottom plate, and resets the rewind release. The lens has three focus zones visible from the top, and a distance scale underneath. Semi-circular film speed scale scale in top plate with pointers at opposite ends for DIN and ASA. Manually-reset frame counter in bottom plate. Flash can be connected via a hot shoe, which has a pin to detect the flash gun; a guide-number scale is fitted in the right-hand end. Power: PX625 battery, placed where the advance lever might be expected. This page was last edited on 4 December 2017, at 06:34.